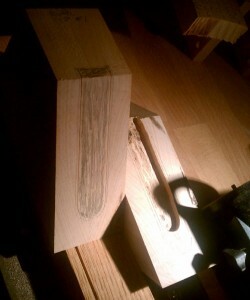 I talk a lot about both setting up and using hand planes. Probably about 95% or more of my audience will either go to their favorite shop to buy a plane, or work to restore an old family heirloom or a garage sale find. There is another way to obtain a plane, and it brings with it the chance to hone some extra skills: Make a wooden plane. The majority of my personal planes are manufactured, but I did make a wooden plane about five years ago, and have made a couple more recently. For some reason, the thought of making a plane can seem pretty daunting, but most can make one successfully. Now, there are really two types of wooden bench planes, in my opinion. One requires a bit more skill than the other. The first is what you’d likely find in workshops in the 1700s on into the invention of the metal hand plane (and even beyond for many). This plane type requires wood to be evacuated from the area that will become the mouth of the plane and up through the body. In most cases, the body of the plane retains most of its structure. 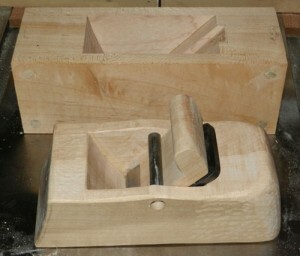 The second, and in my opinion less demanding plane to make, is one where the wooden body is cut into three base pieces. Two outside “faces” are removed from the center core. The center core is again cut into three pieces (toe, heel and a left-over that will make the wedge). 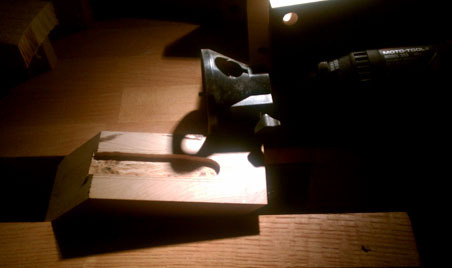 By having the core separate from the other two pieces, you can easily use saws (table saw, band saw, hand saw…) to make the cuts establishing the “heel” piece which will create the bed for the iron, and on the “toe” piece, the curved relief opposite the bed, so shavings can easily be removed from the plane. The bed is what the iron rests on, while it is in the plane. Many bench planes utilize a 45 degree angle for the bed, as this is good for the majority of work. If you are working with very figured wood you can change this bedding angle from 45 degrees up to 50, 55 and even 60 degrees. It does become more difficult to push a plane that is bedded at these higher angles, but they do an outstanding job of handling some of the most figured woods. The wood for the body should be a dense hard wood. There are many different types of woods that can be used, so it’s basically up to the maker. You can make a plane out of 8/4 wood, with the thickness of the wood as the maximum height of the plane, or you can laminate any thickness of wood where the wood thickness is now the width, rather than the height. This provides more flexibility in the design phase, removing the body height limitation you incur with non-laminated wood bodies, while also keeping the cost down as thicker wood blanks (10/4 and thicker) usually command a higher cost. One last thing to remember, relating to the wood grain, is you want the grain running from the toe down towards the heel. Before you make any cuts, I like to drill holes for alignment dowels, in the four corners of the plane blank. These will allow you to get the pieces back into their original orientation when you are gluing up the pieces, after you’ve cut the blank into the required pieces. The next step is to do some layout. For this stage, it is best if you already have the iron you will use in the plane in your possession. This allows for direct measurement, so things actually fit together after the glue-up. Measure the width of your iron, and then add on between an 1/8” and 1/4”, so you can adjust the iron slightly when setting the plane for work. Center your measurement on the plane blank. Mark lines down the length of the plane, as reference, before beginning your cuts. One reminder, always cut on the outside of your line, as any material removed from the center section could diminish the available adjustability, or even send you to the grinder in order to remove metal from the iron so it will fit the opening. Next is cutting the center section into the three sections. First, choose the angle you want for your iron. Mark the angle on the outside edge of the center core, with the angle intersecting the sole about a third or so back from the toe. This cut can be done on a table saw, which can leave a glass smooth surface, or you can use whatever means are available to accomplish the same end results. The other cut line is to a slight arc, coming up from the sole with enough angle so you can reach in to get out shavings. There is nothing hard and fast about which angle you choose. I chose between 60 – 70 degrees, but you can try some different, if you wish. This second cut, since it is a curve, is best made with a band saw, or something else that can handle the curvature. Remember to keep the extra “triangle” piece, for your wedge, and it also comes in handy to back up the side walls when drilling the hole for the cross bar. Next up is removing material on the bed of the heel piece, so the screw for the chip breaker has enough room for the iron to sit flat on the bed. Measure the screw head and then mark out with a little buffer added on, centered on the bed, from the top down to about a half-inch or so from the sole. This will give you enough range so your plane will function for a long time, even after many many sharpenings. I used my dremel, with a flat bottom bit, to remove the necessary material. I did use one of the attachments that allow the dremel to work much like a mini router, so it kept the depth of cut consistent. Join us here tomorrow to read the rest: I’ll talk about the process for gluing up and finishing my homemade wooden plane! This is Part one of a two-part post. To continue to Part two, click here. Nice writeup on making a custom plane. I’ve been looking around for a step-by-step on how to make a curved plane to shape the transition from shaft to blade on canoe paddles that I make. I may try to adapt yours to the shape I need. Sounds like a great idea. It is really a pretty simple process to make a wooden hand plane. I’m sure you’ll have success and come away ready to try another in the future. Just remember to remove really small portions of wood, when getting close to opening up the mouth of your plane. It can seem like things are moving slowly, then just when you decide to speed up the process a bit, all of a sudden the mouth is open too far.